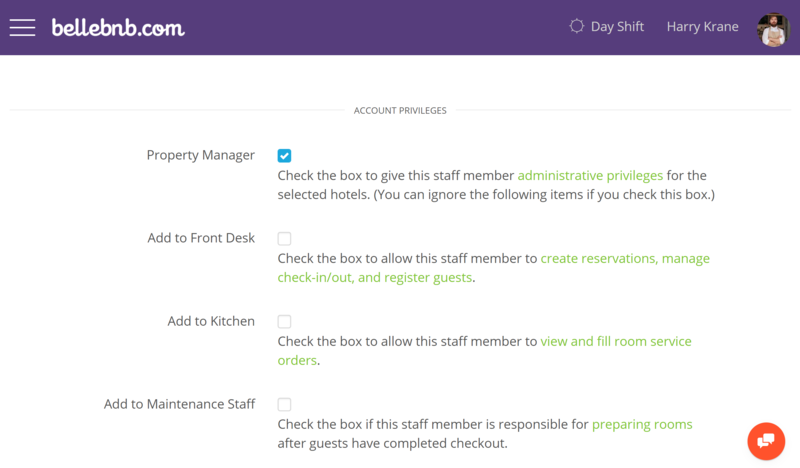 ﻿ Hotel User Management In our latest update to the Front Desk manager, we have added a new user type: Property Manager. Property Managers have the same access level as the Account Owner, but they are limited to the properties assigned to them.!. 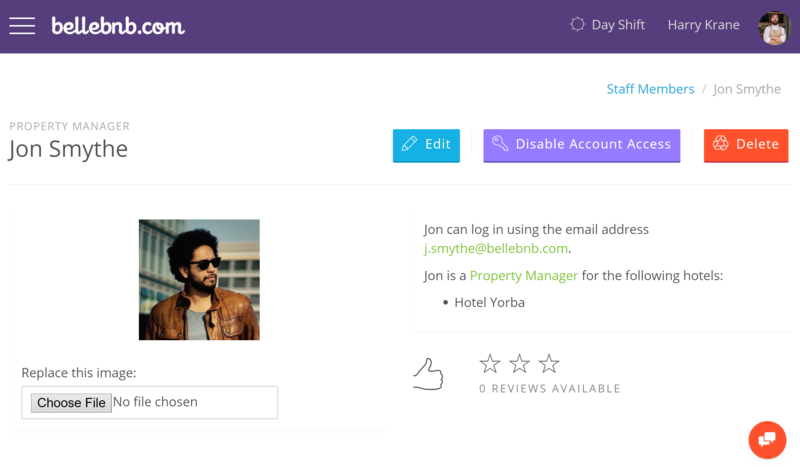 In our latest update to the Front Desk manager, we have added a new user type: Property Manager. Property Managers have the same access level as the Account Owner, but they are limited to the properties assigned to them. 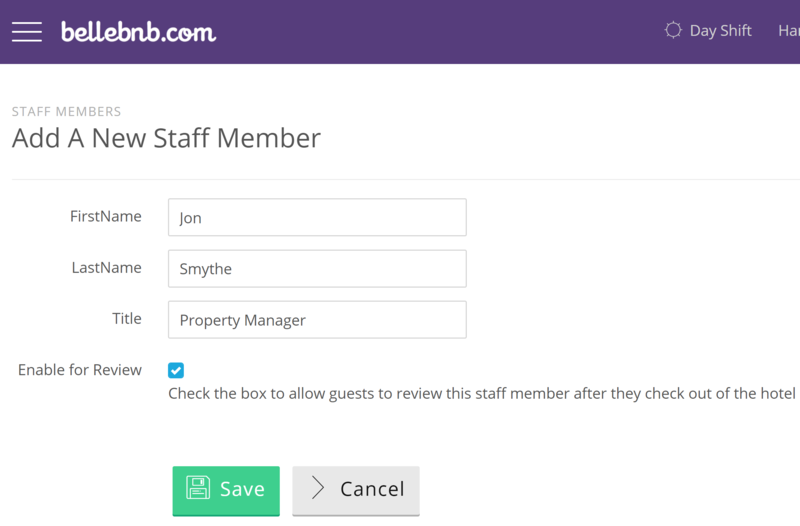 To register a new user, go to ‘Settings > Hotel Staff’ in the left navigation menu, then click ‘Add a Staff Member.’ Enter the staff member’s name and check the box if you would like to enable them for review. 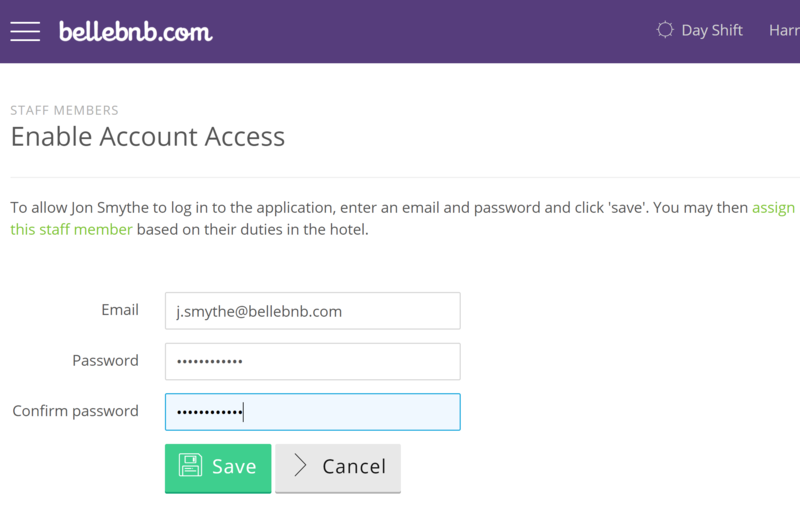 At this point, you have a user registered in your hotel, but they cannot login or access any part of the system. If you have checked the box for this user to be reviewed and your review engine has been enabled, your guests will have the option to review this staff member when they check out. To allow this user to access the system, click ‘Enable Account Access’ and assign a login email and password for this user. Be sure to use a valid email address in case the user needs to reset their password in the future. The next screen asks you to assign privileges to this user. There are three basic types of account users: Account Owner, Property Managers, and Hotel Staff. There is one Account Owner per Bellebnb.com account. This is the user that opened the account. Account Owner status cannot be assigned, transferred, or shared. The account owner has full access to every part of the system for every hotel. Next comes Property Manager. Property Managers have full access to every part of the system for the hotels assigned to them. Property Managers can add, edit and delete staff accounts, but only the Account Owner can assign Property Manager status to a user. Below Property Manager, there is the Hotel Staff, who are assigned access to parts of the system based on their responsibilities. There are three types of staff privileges: Front Desk, Kitchen, and Maintenance Staff. Front Desk users have access to the reservations calendar and guest profiles. They can create reservations and handle check-in and check-out. Kitchen users have access to the list of room service orders, and Maintenance has access only to the list of rooms that needs to be prepared. For the three user levels below Property Manager, you can mix and match privileges as needed. If you have more than one hotel, be sure to assign access to staff members and property managers only for the hotels that they work with. You should include an ID photo for each user to personalize their experience, and to provide visual info for the property manager about who played a part in each step of the reservation process. Managing users is simple and powerful, providing granular access control with minimal effort. The Account Owner should be careful about which users are provided with manager-level access for a property, as these users have control over everything from staff permissions to OTA room pricing.